Have I told you lately that I have the best Dad ever? (I may have) Not only is he an amazing parent- he's a stellar grandparent. My apologies; I need to clear one thing up: My Dad is not a "grandpa." My Dad is not old, grey, wrinkly, I'm pretty sure he doesn't play canasta, nor does he walk with a cane. He's far too young and hip to be a "grandpa." Nay. My Dad is a Papa. He is the most proud and enthusiastic Papa ever. In order to prove this claim, I will tell you a story. Or a series of stories. Or... well, this: I left the room to talk on the phone in some relative quiet. The girls had Papa cornered with books, waiting in line, book in hand, for him to finish one story, just to hand him another and plop down in his lap. A short time later, I walked into the kitchen just as the drinking straws and tape were flying. Apparently one of these books featured a number of musical instruments. Papa, not to be outdone by a mere compilation of literature, decided he would MAKE THEM A SET OF PIPES. With whatever he had on hand. The twins' favorite toy: Papa's Pan Pipes. The girls play their pipes daily with pride. 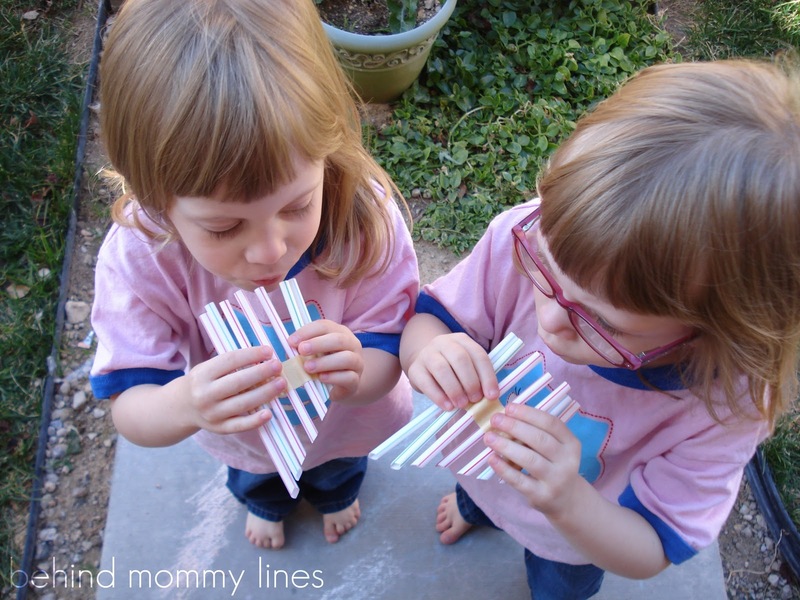 My guess is they love them so much not just because they are cool instruments made of straws, but because they're a reminder of how much Papa loves them, and they feel closer to him. So I tolerate the Pan Pipes. (thankfully they aren't too loud) They must be kept safe from the grabby, crunchy hands of Little Man. It's just one of the million little things my Dad does that makes me smile. Your dad is so hip! So is your mom. I love your parents.